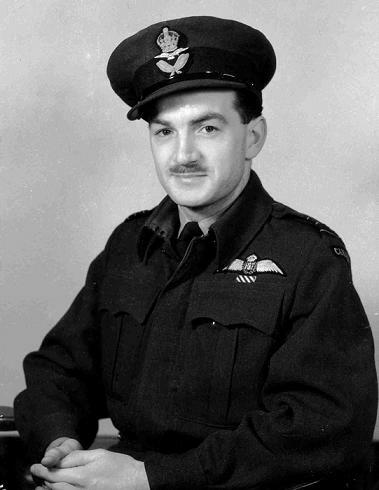 Ottawa born Mervyn Fleming joined the RAF in May of 1938 serving in No.58 squadron. As F/L Fleming he flew on the first mission to drop bombs on Berlin. 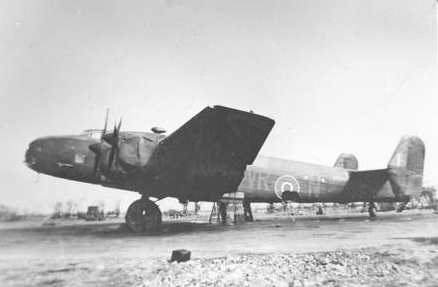 Served as Squadron Leader in Ferry Command delivering Hudson aircraft from Canada to Britain up to around January 1942. Returned to operational duites as C.O. 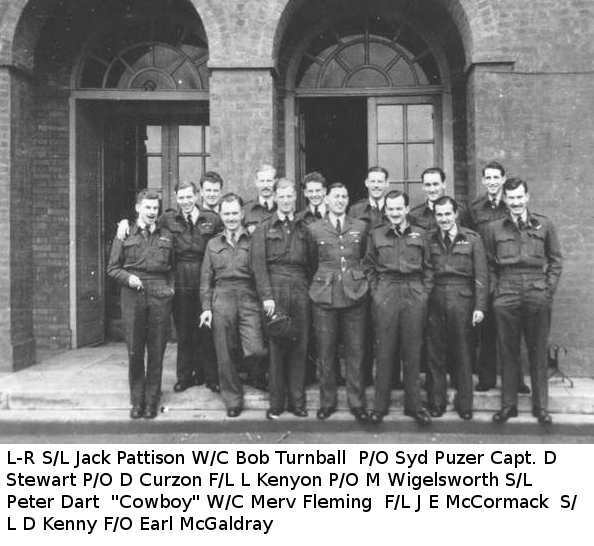 of 419 squadron beginning of September 1942 until October 8th 1943, replacing W/C Walsh who had been KIA on June 28th. A look at the Operations Log shows he had a number of different aircrew he flew with. Most frequently though with F/O C.H. Parker (Nav), Sgt. G.F.Clarke (R/G), F/O A.P. 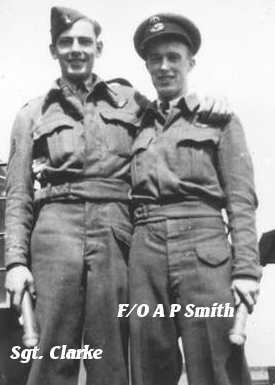 Smith (WAG) and Sgt. O.D. McLean (B/A). He had an interesting turn at the controls of a "Mossy" which was part of a group which had landed at Middleton St.George, S/L Pattison had already had a circuit at the controls of the little two engined aircraft and had pronounced it the most perfect he had ever flown. W/C Fleming's experince was not quite the same. On take off the starboard engine died, the aircraft lost height and disappeared behind some trees. Fortunately even though it was his first time behind the controls of this type of aircraft he brought the aircraft out of the dive and brought the Mosquito in for a perfect landing. DFC "This officer completed 27 trips with over 200 operational hours to his credit. He set a fine example to his squadron as an unspectacular but most reliable captain. I have flown with Flight Lieutenant Fleming and was very impressed by the time and pains he spent in making sure that he identified his target. On one flight his second pilot lost control in cloud and in righting his aircraft the ailerons were completely stripped of all fabric. Flight Lieutenant Fleming returned and landed safely. On another occasion he took off a fully loaded aircraft at night when, through no fault of his own, the pilot [sic, 'pitot'] head cover had not been removed. Flight Lieutenant Fleming landed, removed the obstruction and resumed his sortie. 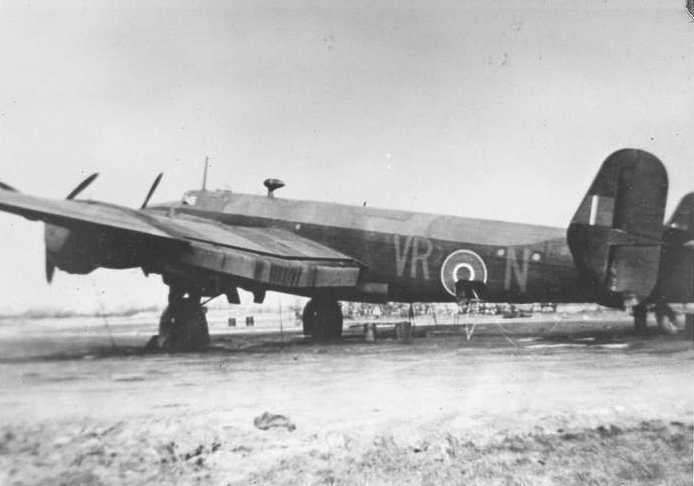 In addition to this example of steady valuable flying this officer was in charge squadron navigation and in this capacity rendered valuable service to the other crews. I consider his activities well merit the award of the Distinguished Flying Cross." 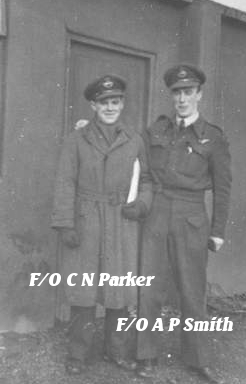 To the above, the Commanding Officer of Station Linton-on-Ouse adds (25 November 1940): Flight Lieutenant Fleming has just those qualities of dogged perseverance and imperturbability that go to make the ideal heavy bomber pilot. I consider his long spell of operational work is well worthy of recognition. DSO "Wing Commander Fleming has displayed outstanding skill, courage and devotion to duty. He has undertaken a large number of sorties during which he has attacked many important targets with success. Wing Commander Fleming is an ideal leader, whose example has contributed materially to the operational efficiency of the squadron he commands." Mervyn Matthew Fleming passed away in 1990.